Fibrothorax is diffuse fibrosis of the pleural space surrounding the lungs. It can have several causes including hemothorax, pleural effusion and tuberculosis. It may also be induced by exposure to certain substances, as with asbestos-induced diffuse pleural fibrosis. 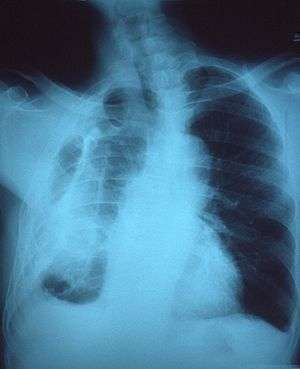 Idiopathic fibrothorax may also occur. In fibrothorax, scar tissue is formed around the visceral pleura following inflammation due to pleural effusion or other pathology. The scar tissue lies in a sheet between the pleura, then fuses with the parietal pleura and the chest wall. Over time, generally the course of years, the fibrotic scar tissue slowly tightens, which results in the contraction of the entire hemithorax, and leaves the ribs immobilized. Within the chest, the lung is compressed and unable to expand, making it vulnerable to collapse. At the microscopic level, the scar tissue is composed of collagen fibers deposited in a basket weave pattern. The treatment for fibrothorax is decortication, the surgical removal of the fibrous layer of scar tissue. However, since many of the diseases and conditions resulting in fibrothorax are treatable, prevention remains the preferred method of managing fibrothorax. Pleural fibrosis & calcification. Dense pleural fibrosis with focal calcification seen here is the end result of organization of intrapleural inflammatory exudate (empyema) most likely accompanying a remote episode of pneumonia. 1 2 3 4 Donath, Joseph; Miller, Albert (2009). "Restrictive Chest Wall Disorders". Seminars in Respiratory and Critical Care Medicine. 30 (03): 275–292. doi:10.1055/s-0029-1222441. ISSN 1069-3424. ↑ Huggins JT, Sahn SA (2004). "Causes and management of pleural fibrosis". Respirology. 9 (4): 441–7. doi:10.1111/j.1440-1843.2004.00630.x. PMID 15612954.